It's so important to give your school age child an outlet for all that budding creativity. Experts all agree on the restorative power of art-it blocks out the sometimes stressful world and lets the child explore the creative unknown. There are so many great art projects you can do with your kids. Art for kids is truly wonderful, because it has no limits and it's not supposed to be technical. For example, many kids draw the sky as a separate zone from the earth, one delineated with a line, and then colored blue. That's fine! It's precious! The only rule is that everything goes! One tip is to keep in mind is that when your child sees a drawing or paint or art piece he likes, they focus on that piece and usually make something similar. 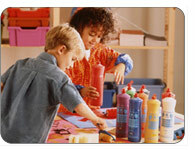 Mimicking art is fine; however, to let your child come up with their own creative pieces, don't show too many examples. Let them come up with their own ideas. If they're having trouble, reassure them that anything they want to draw will be beautiful. Try helping your kid come up with some ideas about a subject or color scheme they want to us if they're really stuck. Buy a rather large sized canvas. About 3 or 4 feet tall and 1 to 2 feet wide. Buy some tubes of acrylic paint-choose colors that go well together and will make a bright statement to the rooms you plan to place the painting in. Magenta, bright orange, sea glass green, morning blue-you get the idea. Put the paints into little pots so that your child can easily choose between colors, then let your child draw whatever comes to her fancy! Color squiggles will brighten the white background. As far as kid's activities go, this one is perfect for school age kids! This activity is great fun, as you first have to go on a stone hunt! Once you've found your stones, usually found in the woods, in gardens, fields or on beaches, bring the stones home and give them a good rinse. Once the stones have dried, you're going to paint them as frogs. The frogs should have eyes and a mouth (with a little red tongue if you like). Paint green, yellow and white spots on the frogs OR paint the entire stone green and speckle with yellow and white! Let kids be creative; even red frogs are OK. Once you've painted the stones and let them dry, the supervising adult should hot glue gun the narrow, flat stones (feet) underneath the larger stone. Have the small stones peeking out. You can put them on the window sill, porch or have them protect the garden from pesky mosquitoes. Get great ideas for art projects from other moms in our school age forum.